Trade wars have created chaos for shipping stocks. Here are three companies with the wherewithal to come out ahead in the long run. Geopolitical tensions have created a difficult environment for shipping stocks, which tend to be tied to the health of the global economy and the volume of international trade. There's reason for hope, with the United States economy still showing signs of resilience, but the constant talk of tariffs and trade wars have made it hard for the shippers or their key customers to make long-term forecasts. The Port of Los Angeles has exemplified this uncertainty of late, recording a sharp drop-off in shipments in November after seeing 27% volume growth in October. The key driver is shifting relations between the United States and China, with 2019 a huge question mark unless the two countries can reach a trade accord. FedEx CEO Fred Smith provided a blunt assessment on a Dec. 19 call with analysts, blaming his company's poor 2019 forecast on "bad political choices" ranging from China's "mercantilism," the Brexit negotiations, and U.S. tariffs. In this climate, it's good to be a long-term investor and focus on businesses you expect to win out over time no matter what chaos the next few quarters bring. Here are three shipping stocks worthy of consideration for a buy-and-hold portfolio. Triton International (NYSE:TRTN), a lessor of the large containers carried on ships and trucks, has seen its shares almost double over the past five years, but the company has underperformed the S&P 500 over the past three months because of concerns that an expanding trade war will eat into results. The near term is foggy, but there's a lot to like about Triton over the long haul. The company has the world's largest portfolio of containers, with about 27% of the global market and more than 5.5 million units deployed. Triton claims to be the top supplier to most of the top 10 global shipping lines. Despite the trade concerns, the business remains strong. Triton generated $1.17 in net income per share in the third quarter, up 6% sequentially and 46% higher than the year prior. The company's utilization rate is more than 98%, and more than 70% of containers are on long-term leases, with an average remaining duration of 44 months. With lease rates climbing and supply tight, shippers might be expected to buy additional container inventory instead of relying on lessors, but a new International Maritime Organization cap on sulfur in fuel set to go into effect at the beginning of 2020 should give the lessors an advantage. The new regulation, which calls for sulfur content in fuel to drop from 3.5% to 0.5%, is increasing expenses for shipping lines at a time when many are already struggling to generate free cash flow. Shippers are increasingly turning to an asset-light model with stripped-down balance sheets and relying on leasing instead of owning assets, meaning Triton and other lessors should benefit from any global growth in shipping. As a bonus, investors feeling seasick from whatever trade choppiness that lies ahead can take comfort in the robust 6.55% forward dividend yield Triton shares offer. USA Truck (NASDAQ:USAK) has traveled a rocky road over much of the past decade, underachieving many of its peers. There's reason for optimism that this transport company is finally ready for the fast lane. The company historically was "structurally laden with waste," CEO James Reed said on a November call with investors. Reed took over in late 2016 and has been working to make the network more efficient, and under his leadership he has reversed a string of quarterly losses with five consecutive profitable quarters. USA Truck is still feeling pressure. The company in the third quarter, despite producing earnings per share $0.05 above estimates, missed on revenue expectations, in part because it continues to experience maintenance issues and is having trouble finding enough drivers. Its average unseated tractor percentage in the third quarter was 6.5%, considerably worse than the 3.9% figure a year prior and up from 4.9% in the second quarter. The company is trying to address maintenance issues in part by bringing down the average age of its fleet from 3.3 years old to a target of 2.5 years old, but efforts to speed fleet replacement have been slowed by delivery delays on new equipment. USA Truck is also implementing "a more intelligent and targeted driver recruitment strategy," Reed said on the call, including a new pay scheme that gives drivers more incentive to be on the road. In addition, USA Truck is trying to add terminals in locations that will allow it to reduce costly over-the-road maintenance expenses and unpaid non-revenue miles. The company, for many years itself a takeover target because of its low stock price, in October bought Davis Transfer Co. for $53 million to add 250 tractors and terminals in the strategically important Southeast region. It's tough to say how the year-end quarter will go for USA Truck with so many moving parts, including a potential influx of new trucks, a new driver wage scale, and a tough comparison to a blowout fourth quarter of 2017. But Reed's initial work reshaping this longtime underperformer is impressive, and management made it clear on the third-quarter call that it still sees a lot of opportunities for improvement. This could be a great stock to hitch a ride with. XPO Logistics (NYSE:XPO) is not a stock for the weak of heart, especially not lately. Rollup specialist Bradley Jacobs has built XPO Logistics from a $177 million-sales trucking brokerage into a $17 billion shipping behemoth in less than a decade, and the stock has more than tripled during his time in charge. But XPO of late has hit the skids, its shares down more than 50% in the past three months on the double blow of lowered guidance and a critical report from short-seller Spruce Point Capital Management. Spruce Point makes serious allegations, saying the company uses aggressive accounting to hide losses and warning that the model was dependent on constant mergers and acquisitions and access to outside capital. XPO responded with its first-ever stock buyback and called the Spruce Point report "intentionally misleading, with significant inaccuracies, and fails to reflect that XPO has delivered strong performance for its long-term shareholders." Spruce Point was forced to go back and modify calculation errors in some of its cash flow analysis but has not backed away from its criticism. I find the Spruce Point report underwhelming. 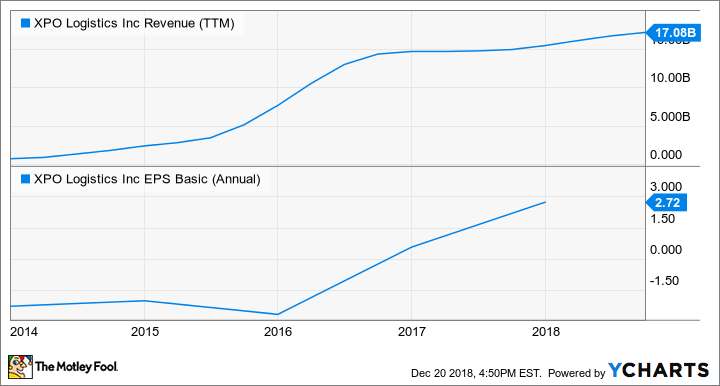 XPO's cash flow trends are in line with reported earnings, and the company is clearly growing on a sales and earnings-per-share basis despite not announcing a major acquisition since 2015. The lowered guidance is primarily the result of 2019 tax items and not a material weakness in the business. XPO signed more than $900 million in new business in the third quarter and said that its global sales pipeline totaled $3.7 billion, up $400 million from a year prior. In the most recent quarter, profitability grew faster than revenue despite a $16 million headwind resulting from a customer bankruptcy in Europe. There is still risk to XPO, especially if the economic cycle has peaked and shipping demand is at risk of slowing. But there's also a lot of potential. XPO Direct, a shared-space distribution program for omnichannel retail and e-commerce customers that attempts to give non-Amazon.com retailers access to a distribution system similar to the one run the e-commerce giant runs, is in its early days. XPO Direct will end the year with nearly 100 facilities, up from 75 at midyear, and management said on the company's third-quarter conference call that it expects the segment to be a $1 billion business within three years. Management said in late October that while the holiday quarter will help boost growth at Direct, it expects growth to continue into the first quarter of 2019. The company is also the second largest provider of less-than-truckload transport in North America, an area of the market that tends to command a superior valuation because the terminal networks are difficult to replicate. And its intermodal business, which offers cross-border transport to manufacturers by rail, independent truckers, and other providers, is gaining share. Overall, XPO is a company that still appears to be on the rise, but trading at about 7.5 times EBITDA, it's cheaper than the likes of C.H. Robinson, at 13.05 times EBITDA, or Old Dominion Freight Lines, at 10.2. Despite the recent stumbles and high-profile criticisms, XPO is still a first-class shipper. Shipping stocks by their nature tend to be as turbulent as the global economy, and the upcoming quarters could be difficult for these companies and the entire sector. But these companies have the wherewithal to withstand whatever comes next in terms of trade wars and come out as long-term winners. For investors with the sea legs to tolerate the volatility, Triton International, USA Truck, and XPO Logistics all deserve consideration on the buy list.